Best Ever Chicken Parm Casserole- What’s for Dinner Wednesday! 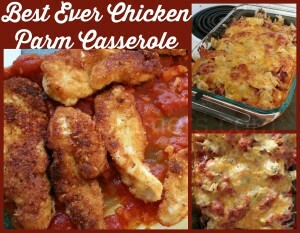 This is THE BEST EVER Chicken Parm Casserole that I have had the chance to taste. Both the kids, and hubby LOVE this dish. I have served it to friends as well who rave all the way home about how much they enjoyed it! I was almost afraid to share my recipe, but VOILA, I will anyways! 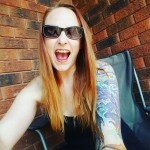 So Check it out! I for one am a huge lover of Chicken Parmesean and Chicken Parmigiana. Just about anything Chicken Parm Oriented makes me super happy in my tummy. So… I decided to make a casserole out of it! The thing I love is that you can make this ahead and refrigerate until you are ready to use it, just don’t sprinkle with the cheese until you are ready to put it in the oven. Once the sauce and the chicken are done cooking you can see how gorgeous it looks, seriously I am drooling! The chicken is so golden brown and aromatic. My house smells AMAZING when I am cooking this. The neighbours start drooling. For REAL. I usually like to serve this with a simple side salad, as this dish doesn’t need much to compliment it, it compliments itself all on it’s own. 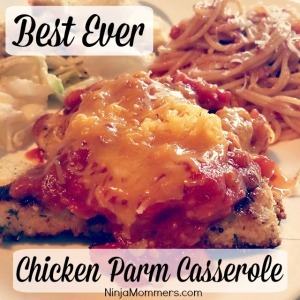 I promise that if you love Chicken Parm, then you will LOVE this recipe. A lot. It’s an amazing addition to your recipe collection. There are usually very few leftovers the next day after I serve this, mostly because people are taking some home to send with their hubby/wife for lunch the next day! We love this recipe so much! This is What’s For Dinner THIS Wednesday, and we are excited! In a large pot heat 2 tablespoons of the oil. Add the onion, carrots, oregano and garlic, season with salt and pepper. Cook until soft. Bring to a boil and stir well. Turn the heat on low and simmer until the sauce has thickened. In a bowl, Mix Parmesan Cheese with the Breadcrumbs. Put Flour, Whisked egg and Breadcrumb mixture into 3 seperate bowls. Coat Chicken with flour, followed by egg and then breadcrumb mixture. Heat remaining oil over med-high heat. Cook Chicken, turning once, until fully cooked. Line a 9x13 casserole dish with 3/4 cup of the sauce. Pour remaining sauce over the chicken. Sprinkle with Shredded cheese blend. Bake in oven Preheated at 350 for 30 mins. What Are You Having for Wednesday Dinner? Oh WOW!!! That looks so incredible! Thank you for sharing the recipe. This looks incredibly good. I saved it and pinned it so we can make it later this week. Thanks for the recipe, I’ll have to look through the rest of them.